PHOTOS: Trove Of Nazi Artifacts Uncovered In Argentina : The Two-Way The artifacts will be donated to the Holocaust Museum in Buenos Aires following an investigation. It's not clear how the objects ended up in Argentina, though many prominent Nazis fled there. 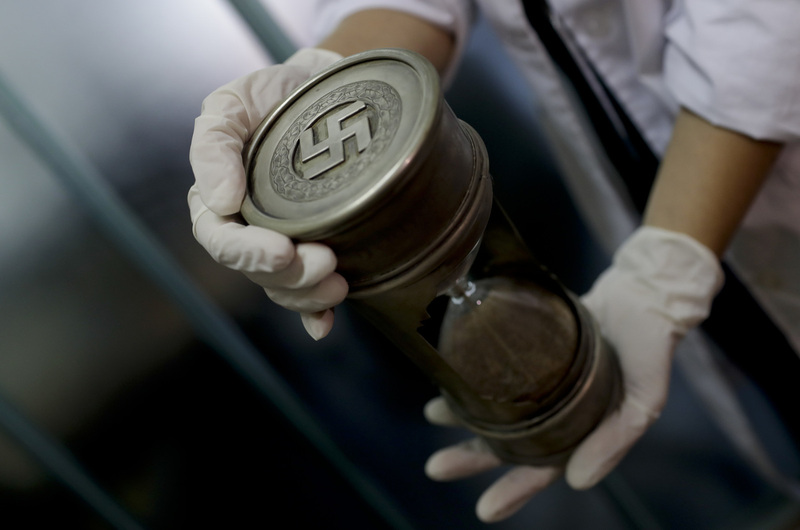 A member of the federal police holds an hourglass with Nazi markings on Friday at the Interpol headquarters in Buenos Aires, Argentina. 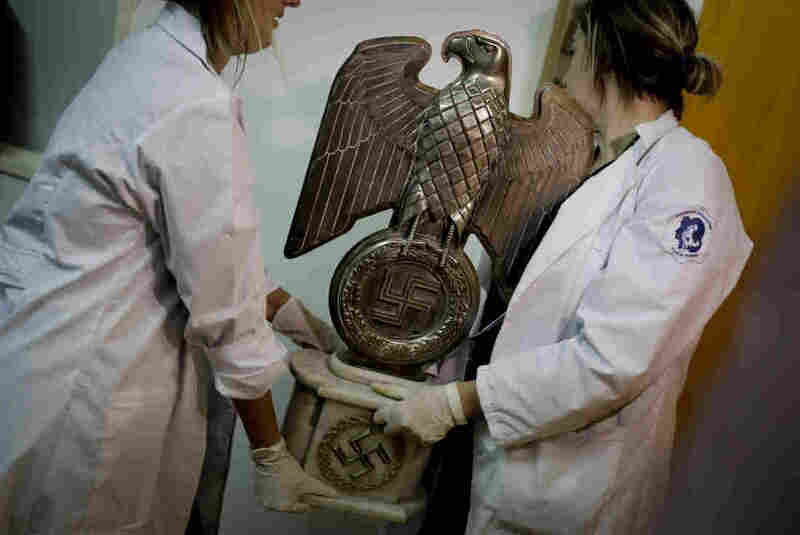 Argentine police have uncovered some 75 Nazi artifacts hidden in a secret room in a house near Buenos Aires. 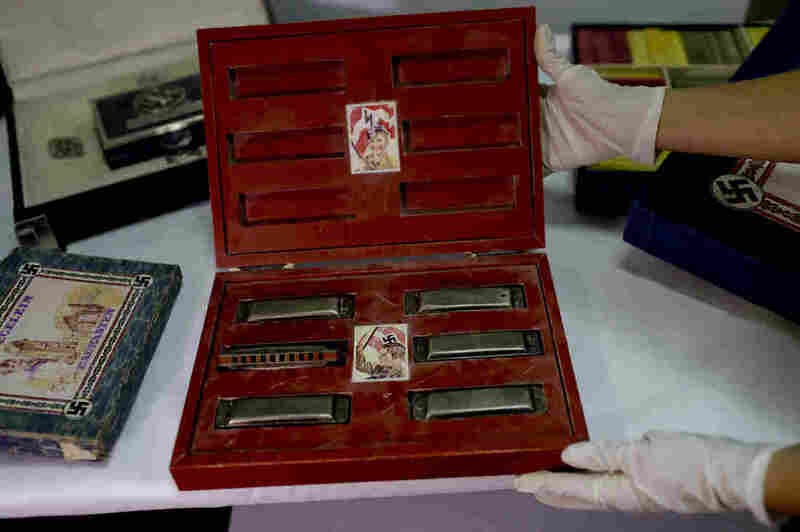 The objects include children's harmonicas in a box adorned with swastikas and a large bust relief of Adolf Hitler. Argentina's Ministry of Security stated that the pieces were all "of illegal origin and of great interest due to their historical value." The finding came after a federal police investigation. The artifacts were found at a home in Beccar, north of the capital, and authorities tell The Associated Press that "they suspect they are originals that belonged to high-ranking Nazis in Germany during World War II." 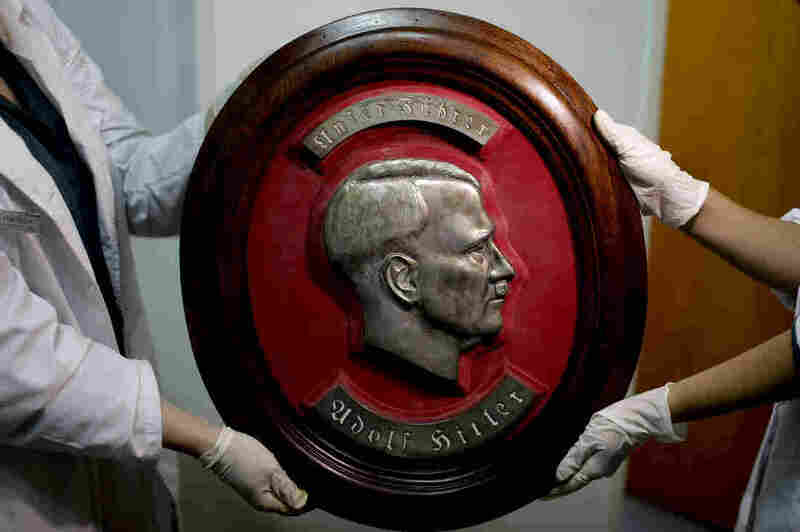 Security Minister Patricia Bullrich told the wire service the artifacts are believed to be original pieces — including a magnifying glass accompanied by a photo of Hitler holding a magnifying glass that looks similar. The combination of object and photo "is a way to commercialize them, showing that they were used by the horror, by the Fuhrer. There are photos of him with the objects," the minister told AP. Police also found a number of toys that authorities believe were used to indoctrinate children. "There are Nazi objects used by kids, but with the party's propaganda," Commissioner Marcelo El Haibe from the federal police told The New York Times. He added, "There were jigsaw puzzles and little wood pieces to build houses, but they always featured party-related images and symbols." The hidden area also held mummified animals and items originally from Egypt, Japan and China, according to the ministry. Many prominent Nazis fled to Argentina at the end of World War II, including Nazi leader Adolf Eichmann and Nazi doctor Josef Mengele. The Washington Post reports that both men lived near the suburb where the artifacts were discovered. The investigation started "when authorities found artworks of illicit origin in a gallery in north Buenos Aires," according to the AP. Then, "agents with the international police force Interpol began following the collector and with a judicial order raided the house on June 8." The collector "remains free but under investigation by a federal judge." It's not clear when the items arrived in Argentina, or who brought them there. Once authorities have completed an investigation, Newsweek writes, the artifacts will be given to the Holocaust Museum of Buenos Aires. Claudio Avruj, the minister of human rights and cultural pluralism, said, "This decision to bring these pieces to the Holocaust Museum will put strong barriers against hatred and discrimination," according to Newsweek. "These facts show that the Holocaust did not end with the passage of time because there are people who try to keep this policy of death, discrimination and hatred alive."